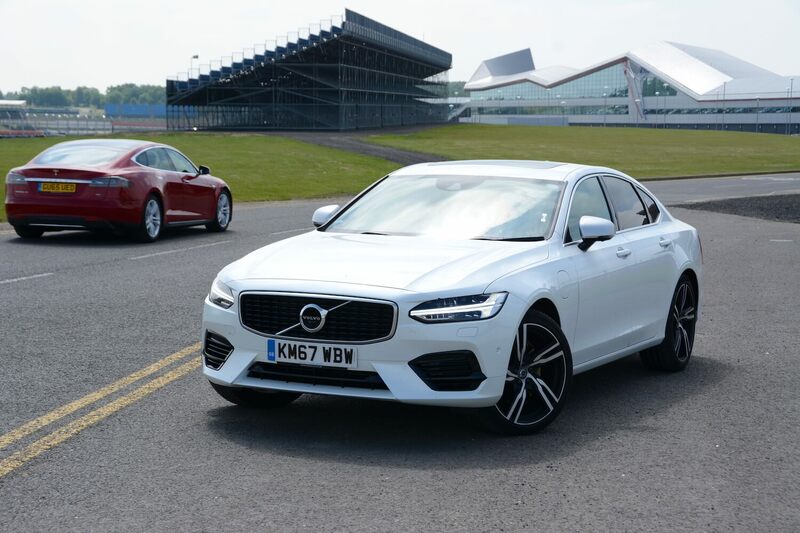 The Volvo S90 T8 Twin Engine offers an amazingly refined and comfortable motorway driving experience, with the potential of decent economy, and also excellent performance. 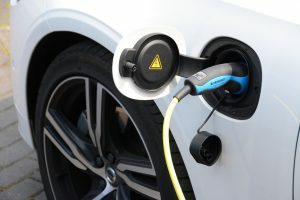 Lots of plug-in hybrids have currently been taken off sale because they don’t perform well in the new WLTP economy and emissions test. 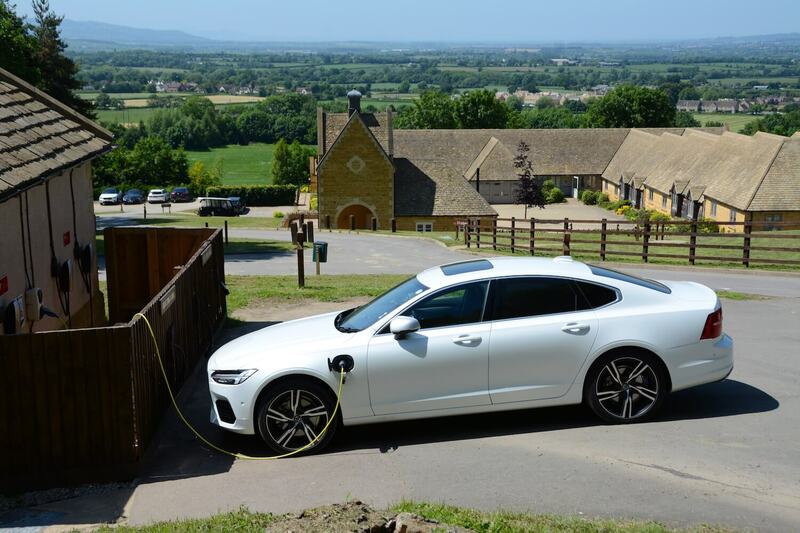 However you can still buy plug-in hybrid Volvos; the company has re-certified all of its model range under WLTP, and due to the decent driving range from the batteries, Volvo PHEVs are performing well on paper – so how about in real life? 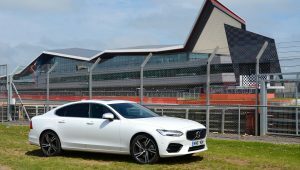 The Volvo S90 T8 Twin Engine shares the new Volvo design language with the V90 Estate and the rest of the revised Volvo range. It looks great at the front, and even from the side – helped by the R-Design Pro spec – but in our eyes the rear is too fussy and angular compared to the rest of the car. 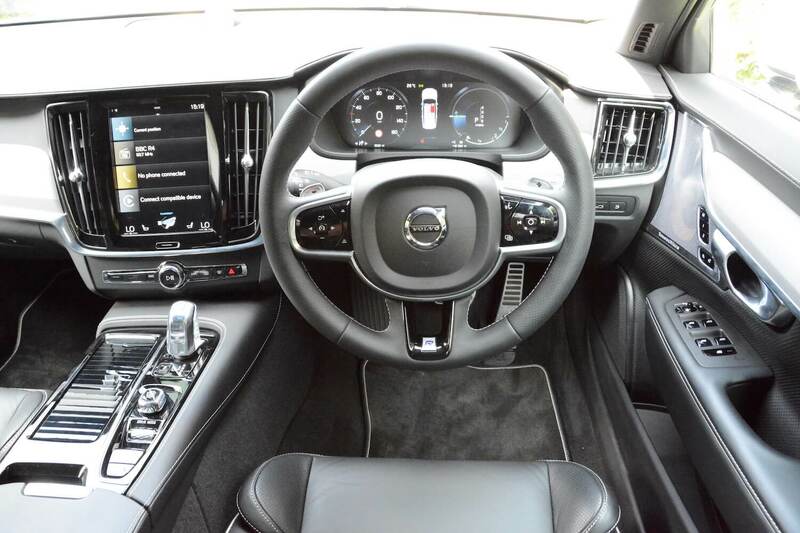 The interior is also very familiar to anyone who has driven the latest Volvo range, which means that it has an attractive design and a high quality feel – along with lots of the latest technology. 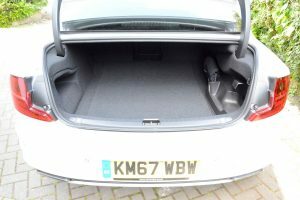 Although this is a big car, the boot doesn’t offer much space; the V90 Estate is much more practical. There’s also what is effectively a large ‘transmission tunnel’ (blame the battery) that virtually eats into all legroom for any central rear seat passengers. The S90 T8 Twin Engine has a four cylinder, two-litre petrol engine, together with an electric motor powered by a battery, which you plug in to charge. The Volvo S90 T8 Twin Engine is amazingly refined, quiet, comfortable and relaxing to drive on long motorway journeys. Although it can be economical if driven carefully, if you do have to quickly get past the hazard that is known as people sitting in the middle lane on motorways, then there’s lots of performance (and it also makes a good noise). And having electric power is also useful on motorways, for when you’re crawling along in a queue behind a crash caused by that person sitting in the middle lane with brain disengaged. The V90 is also highly impressive in normal driving; despite driving electric cars on a regular basis, it still feels like a novelty to drive a big, comfortable Volvo around town on silent and responsive electric power. 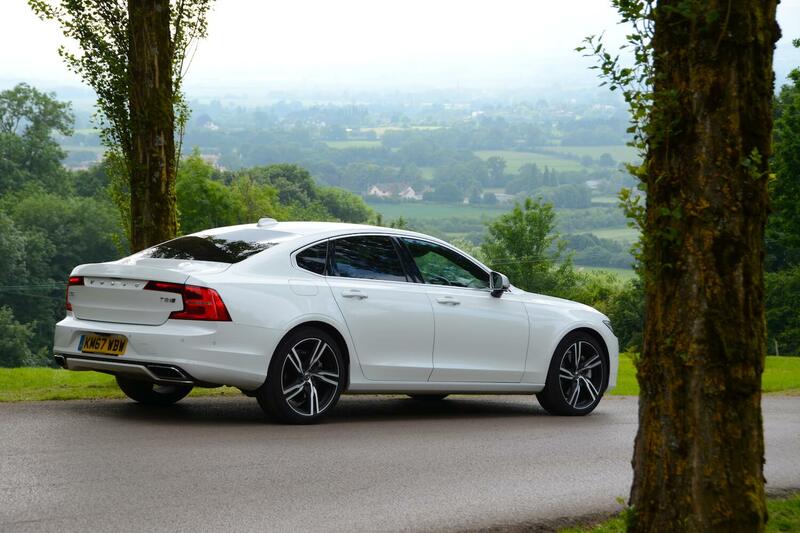 The S90 is also more refined than a Tesla in terms of ride comfort and sound insulation from the road. In fact ride quality is excellent – helped no doubt by the option on our test car of ‘Active Four-C Chassis – Four Corner Adaptive Dampers with Two Corner (Rear) Electronic Air Suspension’ – at a cost of £1,500. Ride quality and comfort take priority over agile, sporty handling. The V90 T8 Twin Engine Estate that we had on test had no steering wheel-mounted paddles, and so there was no way of changing gear, which was very frustrating. The S90 did come with paddles, which made it a much better car to drive, but for people used to BMWs, having to pull the gear selector from Park into Drive twice rather than just once can become a bit tedious. There’s a rotary selector to choose drive modes (which can react slowly when you first start the car); you can use this to select AWD, Pure (ie. electric), Hybrid and Power. It’s certainly useful being able to change the front-wheel drive Volvo into all-wheel drive if road conditions are slippery. You can also select ‘Hold’, to maintain the battery charge – such as for when you’re driving on a motorway and want to save the battery for EV driving in a built-up area later on (there’s also a ‘Charge’ function to charge the battery from the petrol engine). However you have to go into the touch screen and swipe it to access a secondary ‘car functions’ screen in order to do this. This feature was originally on the rotary dial when the XC90 T8 was launched, but it’s been moved – we’d prefer to see it moved back please Volvo – if not back onto the rotary dial, then maybe a button next to this dial, as it’s too much faff continually delving into the touchscreen to select the Hold function. We’re not great fans of touchscreens, unless there’s a separate i-Drive-style rotary controller, but Volvo’s screen actually works quite well (apart from having to find your way through a multitude of screens to de-select traffic announcements). 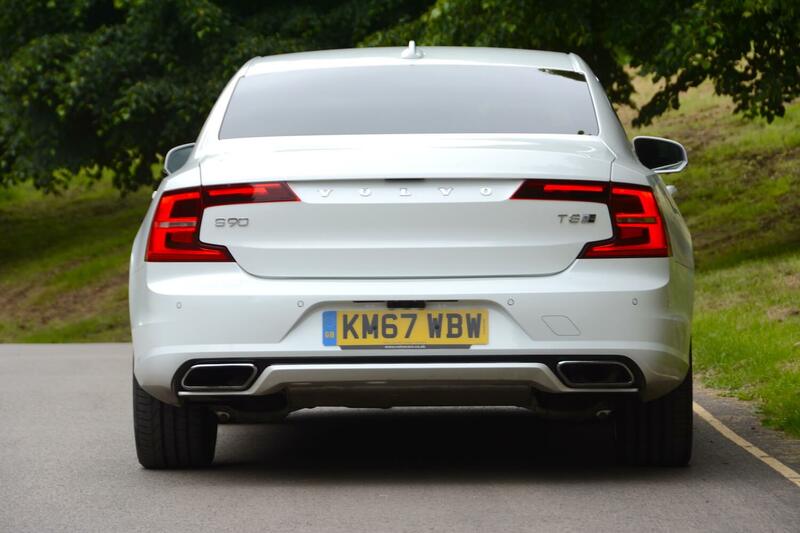 And the S90 is clever – it even tells you about temporary speed restrictions on motorways. One very clear fault with this test car was the complete lack of brake feel; the V90 T8 Twin Engine Estate didn’t suffer from the same problem, so we’ll give the benefit of the doubt to Volvo and assume this was a one-off issue with this particular car. 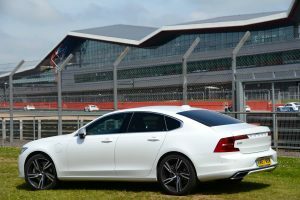 However another issue that all Volvos are prone to is lots of beeping when driving in built-up areas when the car sees parked vehicles on the left and thinks you’re going to crash. The sensitivity of this system seems like it needs a bit more work. The official NEDC combined fuel economy for the Volvo S90 T8 Twin Engine is 141.2 mpg, with CO2 emissions of 46 g/km. As regular Green Car Guide visitors will be aware, 141.2 mpg is a meaningless figure for a plug-in hybrid, because real-life economy will completely depend on how much driving you do on electric power. If most of your journeys are on the battery, then you might achieve over 100mpg. Volvo has also published economy and emissions figures from the new WLTP test for all of its models; under this regime, the emissions for the S90 T8 Twin Engine rise from 46g/km to 49g/km CO2, which is much less of an increase than most other PHEVs. But how did we get on with economy in real-world driving? 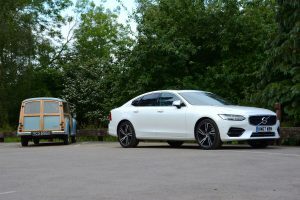 With our normal split of around 80% on motorways and 20% on other roads, after a week we averaged 53.0 mpg – with careful driving – which is a good result for a car such as the S90 when primarily on long journeys. The electric driving range was displaying as 25-28 miles every day, although we generally achieved 20-22 miles in practice (mainly around town, when accelerating a two tonne car uses a lot of energy). Total driving range was working out to be around 500 miles on a full tank and with a full battery. Of course you’ll need to plug the car in as regularly as possible to maximise fuel economy – when it should take just a few hours to charge from empty to full (official figures say recharge times are 5 hours for 240v, or 3 hours for a 3.6 kW charger). At £56,455 the Volvo S90 T8 Twin Engine R-Design Pro is fairly expensive – and even more so in the case of our test car due to all of the options: Intellisafe Surround (£600), Seat Pack (£1,050), Family Pack (£275), Smartphone Integration (£300), Active Four-C Chassis – Four Corner Adaptive Dampers with Two Corner (Rear) Electronic Air Suspension (£1,500), Keyless Drive (£575), Parking Camera 360 Surround View (£700), Sensus Connect with Premium Sound by Bowers and Wilkins (£3,000), and Metallic Paint (£700). All that took the price to £65,155. However the S90 range is available from £33,865 for the D4 Momentum; there are petrol and diesel engine options in addition to the plug-in hybrid. Trim levels are Momentum, Momentum Pro, R-Design, R-Design Pro, Inscription and Inscription Pro. The Benefit in Kind rate of 13% has risen compared to recent years but is still much lower than a petrol or a diesel equivalent. 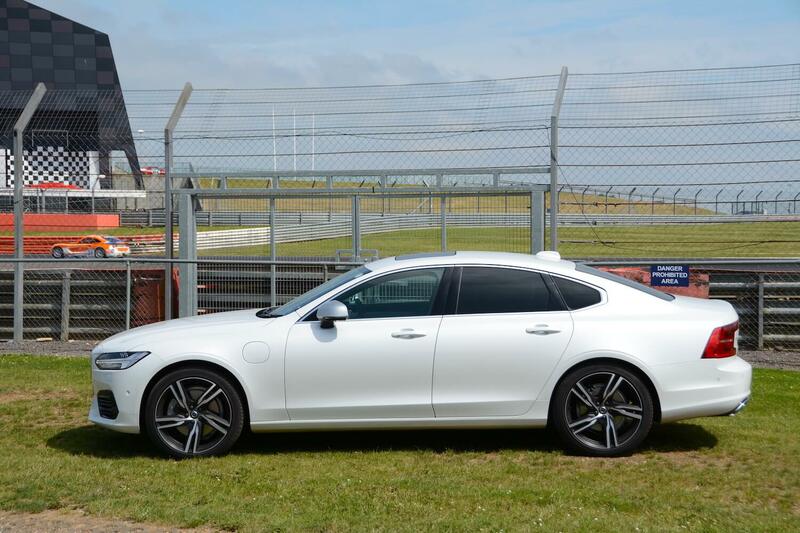 The Volvo S90 T8 Twin Engine is a very impressive car. It shines on the motorway, when it is supremely refined, quiet and comfortable. It also has the potential to be economical if it is charged regularly and driven carefully. Yet it also has large reserves of power if asked. Overall, like most of today’s Volvos, it is extremely relaxing to drive – which has to be a good thing for our chaotic roads. However ultimately the S90 has to be somewhat of a niche choice because, with its boot, it’s not very practical – but of course there’s always the V90 Estate. 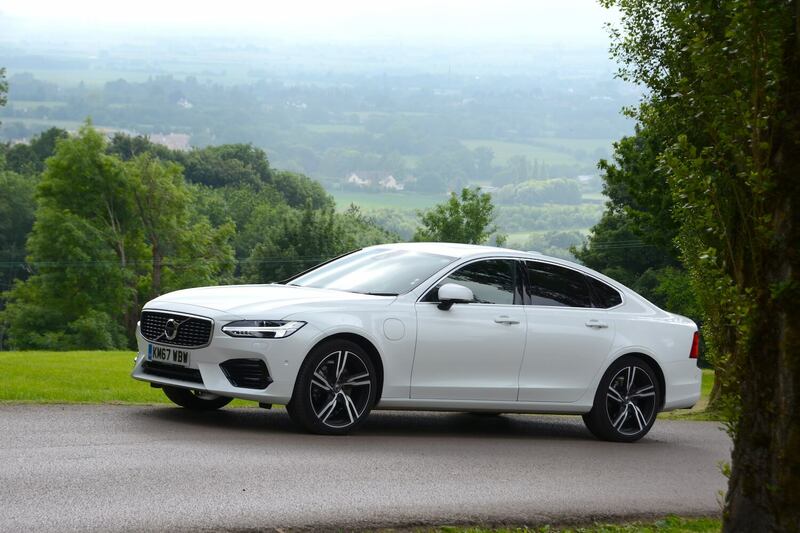 Overall, the Volvo S90 T8 Twin Engine is awarded a Green Car Guide rating of 8 out of 10. 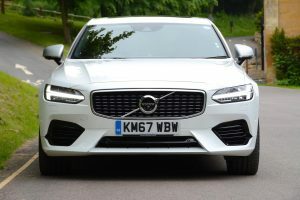 The S90 also shows that PHEVs can work; many people want to kill off diesel cars, and many people would like pure EVs rather than PHEVs – but if driven carefully, PHEVs such as the S90 can be efficient – as our real-world economy of 53.0 mpg shows.